A fire at the Surf Beach Tip yesterday afternoon brought crews from as far away as Nowra and Braidwood. Photo: Matt Green Surf Beach RFS Facebook. Just as the Bemboka community was gathering for a progress report on a fire they have been living with for a week, residents up the road at Surf Beach watched anxiously as flames sprung from their local tip. The unfolding emergency surprised everyone at around 2:15 pm yesterday (August 22) when the fire alarm rung at Surf Beach tip near Batemans Bay. Rural Fire Service crews from Batemans Bay, Surf Beach, and Malua Bay worked with Fire and Rescue NSW personnel from Batemans Bay, Nowra, and Braidwood as well as two helicopter water bombers to bring the rubbish fueled fire under control. 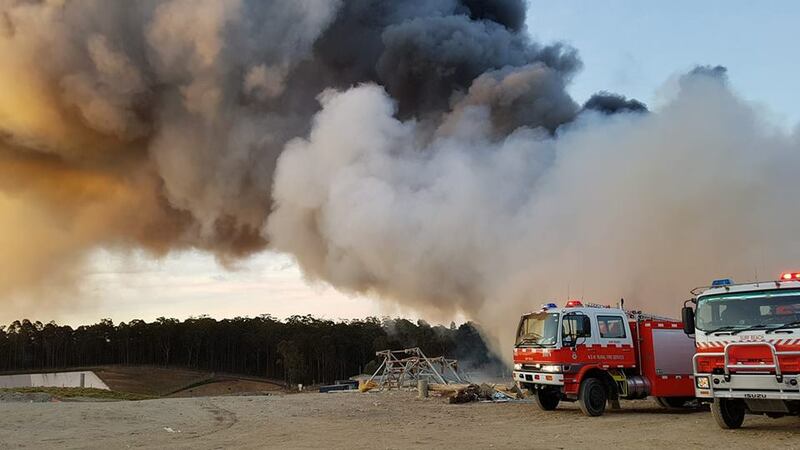 Eurobodalla Shire Council owns and manages the facility, “We thank NSW Fire and Rescue and the RFS for their prompt response,” a spokesperson says. The cause of the fire is unknown at this stage and thankfully no one was injured in the blaze. 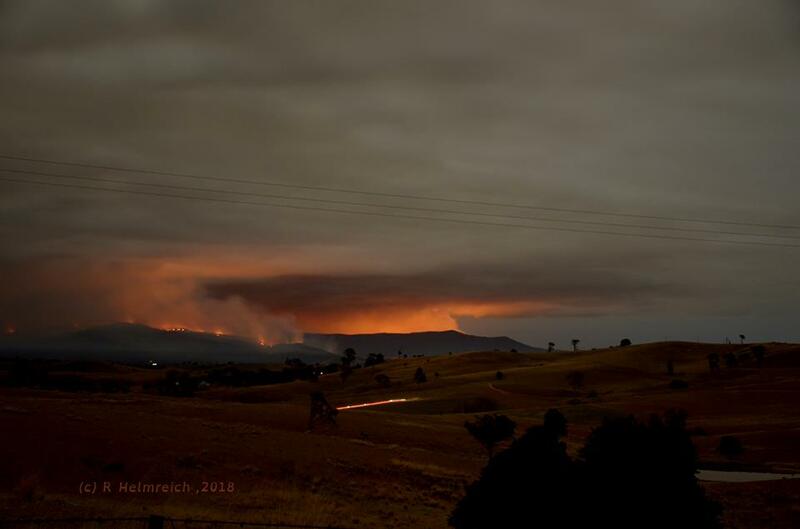 Southern NSW Local Health District issued warnings about smoke from the blaze and at the peak of the fire suggested people with respiratory conditions to stay indoors as the risks from smoke pollution increased. Director of Public Health, Tracey Oakman, advises that the health effects from breathing smoke vary between people, ranging from eye and respiratory tract irritation, to serious aggravation of existing lung conditions such as asthma and emphysema. “Not everyone who is exposed to the smoke will have health problems and most healthy adults who experience symptoms will recover quickly and not suffer any long-term consequences,” Mrs Oakman says. Meantime the extraordinary effort to keep the vast Yankees Gap Fire in the Bega Valley contained rolled on. 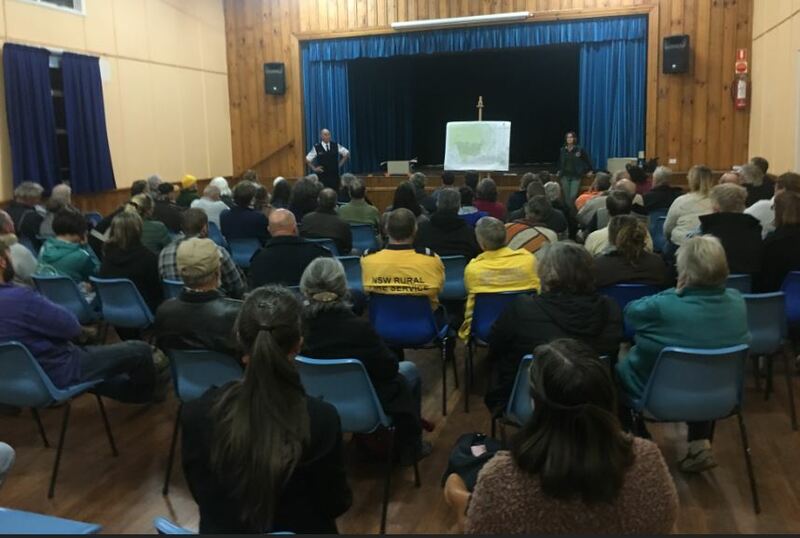 One week since flames destroyed three homes in communities north-west of Bega, the RFS and National Parks and Wildlife Service pulled residents together for a community meeting at Bemboka Hall. The info session followed a similar meeting on Monday night at Brogo, the north-eastern end of this 7,453-hectare fire. Frustration that a private hazard reduction burn was able to start such destruction was a feature of last night’s meeting especially. “Why was that burn allowed to continue?” one gentleman asked. “Firefighters were working with that property owner, it was no different to any other person who had a fire going on those days,” RFS Superintendent John Cullen says. A number of people asked why the start of the fire season and as such the need for a fire permit hadn’t been brought forward given the “super dry” conditions. “The Bushfire Danger Period in the Bega Valley starts on the first of September,” Mr Cullen says. “Some districts further north have changed to the first of August. “We just can’t pull the Bushfire Danger Period forward, its something that is controlled by legislation. “Just as many people want the fire season shortened as want it extended,” Mr Cullen says. “If we have to drag resources off here [Yankees Gap] to other fires in the district it will take away from our gains here,” he says. The skies of Bemboka, Numbugga, Brogo glowing orange, August 22. Photo: Rachel Helmreich. As the meeting progressed smoke from back burning to the north of the hall glowed orange in the night sky. Almost 85 firefighters from the RFS, NPWS and Forestry NSW continue to follow a plan that when complete will blow the size of the fire ground out to 22,000 hectares. Five helicopters and a range of bulldozers and heavy machinery are also part of the operation that Mr Cullen says could last up to a month. Progress is steady and guided daily by localised weather forecasts, burning is expected to reach the Brogo Dam today (August 23) while crews return to unburnt ground around Numbugga and Bemboka in order to deepen containment lines. From Brogo Dam, helicopters will drop incendiary devices to extend the fire along the Brogo River back towards where the fire started and adjoining country to the north-west burnt in 2013 by the NPWS. As with Surf Beach yesterday afternoon, residents are being warned of increased smoke as crews work towards beating forecast westerly winds. Cooler overnight temperatures may force smoke to settle in low lying areas. “Rain is forecast for the weekend,” says Wendy Constable from the National Parks and Wildlife Service. “But unfortunately the forecast has got less and less as the week has gone on, we have a 15 to 20% chance of up to 5mm Saturday and Sunday. “That can actually hamper back burning because it makes the tracks slippery. “We’ve got a window of opportunity to burn right now so we have scaled up resources,” Ms Constable says. “It might look like its all burnt out, but there will be things still burning,” he says. John Cullen and Tracey Constable address last nights community meeting at Bemboka. Photo: Ian Campbell. The meeting expressed resounding gratitude and support for firefighters, one speaker asked, “How can we support your work?” To which Mr Cullen rallied the room to take care and be ready for fire. “There are a lot of ways to start fires, earlier in the week we had a bearing on a car start a fire on the side of the road, electrical lines at 3 o’clock in the morning last week, mowers, grinders, the brake on a motorbike out at Buckajo the other day,” he says. One specific local issue that was raised last night concerned access along Desert Creek Road, Numbugga to Hawkes Head Road, Brogo. The gentlemen that raised the point suggested movement had been blocked within the last few years by a fence, which restricted residents to only one escape route on days like last Wednesday. Two of the three homes lost were on Desert Creek Road, with some at the meeting suggesting one resident was forced to cut the fence last week in order to reach safety. “We’ll always support legal access,” Mr Cullen says. Apart from the Yankees Gap and Surf Beach fires, four other fires are being monitored in South East NSW, all sit at the lowest Alert Level – Advice. West of Moruya in the Araluen Valley the Wheel Gully Fire has burnt out 414 hectares and is “being controlled” while smaller fires at Bodalla, Michelago, and Adaminaby are under control. To stay up to date check Fires Near Me on the NSW RFS website, for advice on protecting your property and family go to Plan and Prepare.